Next on my list of historic book structures to do, was a typical Medieval limp binding. This is described by Szirmai in his text: "the covering is largely of coarse parchment, sometimes of two pieces pasted together...cut off flush with the bookblock; limp leather coverings or leather edging are exceptional. 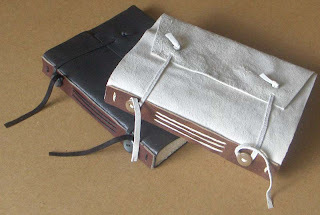 The lower cover usually extends to a rectangular front-edge flap, with one or two cords to tie them around flat buttons of horn, leather or metal on the back" (p. 299, The Archaeology of Medieval Bookbinding). This type of book dates from 1375 to 1500. So here are my books, but certainly they aren't exact replicas. I have used thin limp leather, not parchment. One is black sheepskin, and the other is white suede lambskin. The pages are 50lb Canson paper...not readily available in the 1400s. The spines are reinforced with thicker leather strips although I believe originally wood may have been more common for the spine piece. The buttons are plastic...not very authentic. The binding is really very basic, though. It is the shape and style of the covering that makes this representative of the Medieval books. The sewing is a standard longstitch and chain stitch, directly through the cover and spine reinforcement. 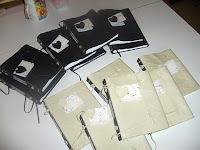 Although I haven't been making many books like this recently, I used to make a lot of them. I had one of these up for auction on Ebay and I was contacted by a university lecturer in medieval manuscripts and binding structures in Norway, who had seen the book and he wrote, "I should say this is the first one of items advertised as Medieval that is convincing and even impressive." Next on my list is the secret Belgian binding, or the girdle book maybe. 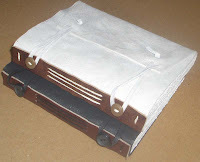 Verry nice limp binding, i am alsow a fan of Szirmai.Check out my blog about girdle books. Boekbinden in your favorits. By the way, i was already three times in Halifax and i like it.